Project Management Best Practices on MPMM.com. Project Management Best Practices: Download a methodology aligned with the best practice standards for project management - the PMI PMBOK® and Prince2. MPMM™ is considered a "Best Practice Project Management Methodology" because it is aligned with the worldwide standard for Project Management: PMBOK® (Project Management Body of Knowledge) Guide. By aligning with the PMBOK® Guide, MPMM has become a leader in the Project Management Methodology market. We will explain more about this alignment below. With more than 450,000 members around the world, the Project Management Institute (PMI) is the world's foremost advocate for the project management profession (see www.pmi.org). Created by the PMI, the Project Management Body of Knowledge (PMBOK® Guide) is a collection of processes and knowledge areas widely accepted as best practice within the project management discipline. 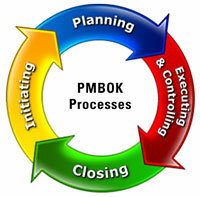 The PMBOK® Guide is an internationally recognized standard and includes five basic Project Management processes; Initiating, Planning, Executing, Controlling and Closing. How are MPMM and PMBOK® aligned? By creating the MPMM Phases in parallel with the PMBOK® Process Groups, we have been able to achieve a tight alignment between the Method123 Project Management Methodology (MPMM) and the worldwide Project Management Body of Knowledge (PMBOK®). Where the PMBOK® shows you what you need to do, MPMM shows you how to do it. Join the Method123 newsletter	, offering free Project Management advice, discouts, and deals. "Regardless of your industry, MPMM provides you with a best practice approach to delivering projects. You'll find it invaluable for initiating, planning, executing and closing projects successfully"